Cherie Calbom is a clinical nutritionist who is known as ‘The Juice Lady’ and is the author of the book “Juicing for Life”, which has sold almost two million copies in the US. Cherie Calbom’s book, The Juice Lady’s Turbo Diet, includes a complete dietary program with an emphasis on fresh juices, to help you lose weight and boost your health. Fresh vegetable juices are the foundation of The Juice Lady’s Turbo Diet because they provide concentrated nutrition and are low in fat and calories. They also help to curb cravings because they satisfy your body’s requirements for nutrients and they are high in antioxidants that help to prevent aging and boost immunity. The Juice Lady says the sugar content of vegetable juices is much lower than that of fruit juice, and they contain half as many calories. Two glasses (10 to 12 ounces each) of vegetable juice are to be consumed daily. Although freshly made juices are always preferred, if you don’t own a juicer and can’t afford to buy one it is acceptable to buy fresh juices from a juice bar or grocery store. As a last resort low-sodium V-8 juice can be substituted however dieters are advised that results will not be as good because most of the vitamins and all of the enzymes in the juice are destroyed during processing. In addition to fresh juices dieters eat a selection of healthy foods including low-glycemic carbohydrates, lean proteins and healthy fats. Most of the foods you eat should be alkaline forming so you will emphasize vegetables, fruit, sprouts, nuts, seeds, healthy oils and super greens. Ideally 70-80% of your diet will consist of raw foods. Fruit is limited at the beginning of the diet because of its higher sugar content and because it can contribute to Candida yeast overgrowth . Tofu, legumes, whole grains and organic and free-range animal proteins are permitted in small amounts. The Turbo Juice Diet includes an all-raw menu plan and a menu plan with some cooked foods and animal products. The Juice Lady recommends that you should also drink eight to ten glasses of water a day to which you can add unsweetened cranberry juice to improve the flavor and assist with the elimination of excess water from your body. One cup of green tea daily is also advised because it boosts metabolism. Foods to be avoided include refined carbohydrates, sweets, alcohol, coffee and soda. Fresh vegetable juices, low sodium V-8 juice, vegetables, fruit, sprouts, nuts, seeds, avocado, flaxseed oil, olive oil, coconut oil, tofu, legumes, whole grains, organic meat and poultry, organic eggs, unsweetened cranberry juice, green tea. Juice Dieters are advised to exercise three to four times a week as part of the Juice Lady Turbo Diet. A combination of aerobic exercise, strength training and stretching is advised. 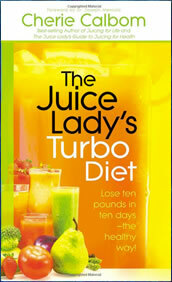 The Juice Lady’s Turbo Diet (Lose ten pounds in ten days – the healthy way) retails at $17.99. It is also highly recommended to purchase a juicer, which can start at around $80. Fresh juices provide concentrated nutrition in a form that is easy to absorb. Research shows that one or two glasses of fresh vegetable juice a day increases weight loss by four times in comparison to non-juice drinkers. Fresh vegetable juice has been associated with improvements in hypertension and metabolic syndrome. Acknowledges the importance of adequate restful sleep and a positive attitude. The Juice Lady is a certified nutritionist. Includes meal plans, recipes and shopping guides. Requires elimination of many foods including sweets, alcohol and coffee. Necessary to purchase a juicer for best results. Will be necessary to purchase a large amount of fresh produce. Will require more time to be spent on juice and food preparation. Provides dieters with unrealistic weight loss expectations. The Juice Lady’s Turbo Diet is a weight loss plan that emphasizes fresh vegetable juices and raw foods. This juice diet will appeal to dieters who are interested in improving their health and nutritional intake as a lifestyle approach to healthy weight management.